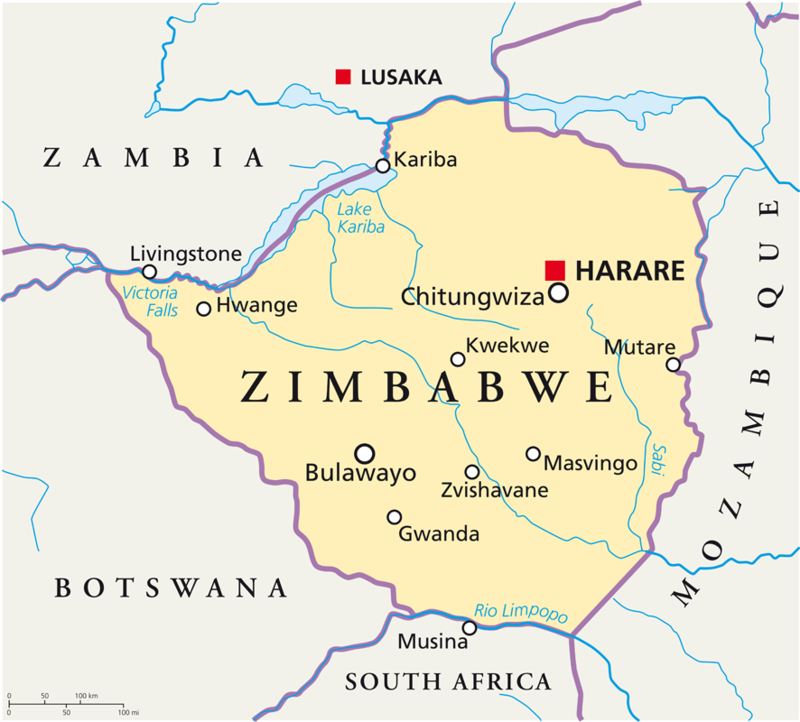 A landlocked country of 151,000 square miles, Zimbabwe’s charm lies in its tracts of unspoilt wilderness, moderate climate and diversity of landscape. You view game in unfrequented areas, walk, ride, or follow a leisurely canoe trail. White-water raft down the Zambezi, play golf on challenging sun-drenched courses, trek among the mountains and crystal streams of the Eastern Highlands. Victoria Falls, ‘The Smoke that Thunders’ a true natural wonder, especially when in full flow, where a curtain of water 1,700 metres wide, thunders over a basalt lip and plunges into a rocky chasm far below. There are lots of ways to experience their impressive power – sunset cruises, whitewater canoeing trips, and the ultimate helicopter ‘Flight of Angels’ which provides you with an aerial view. The more adventurous can whitewater raft in the gorges below, with heady excitement of negotiating rapids. An early sunrise start is the best time to spot animals – lion in particular – the nocturnal animals are heading to a resting spot after a hard night’s hunting, while the diurnal fauna are beginning to stir. The light is lovely and gentle for photographs. Spend the morning with your guide, listening, observing, and tracking while being gently warmed by the sun. Silent and elusive, you will be surrounded by animals even if you can’t see them! Return to camp for a delicious breakfast, or have it alfresco under the trees. Rest and relax during the heat of the day. Later, after a refreshing cup of tea you set out in again in an open Land Rover, to see the animals in the golden afternoon light, stopping to enjoy an evening drink as you watch the sunset over the grasslands. Game viewing at night is exciting, when the nocturnal animals with their amazing shining eyes emerge. Dine beneath the stars, discuss the day’s highlights around a campfire, and drift off to sleep to the sounds of the African bush. Canoe trails, from 1 – 10 days take place on various stretches of the Zambezi. The Ruwesi Canoe Trail runs between Ruchomechi and Mana. You travel around 40 miles a day and then spend the nights on remote banks in a lovely mobile camp. This magnificent stretch of the mighty Zambezi forms the natural boundary of Mana Pools’ Park. Huge trees shade the rive terraces, and purple mountains rise beyond the reed-edged waters. Fly to Kariba and onto Mana Pools, where your professional guide takes you game viewing for the afternoon. Canoeing begins the next day using 18ft Canadian canoes, which are easy to manoeuvre. Meander through channels rich with birdlife. Partly submerged, hippos gaze at you. Elephants come to drink. When evening falls, the light softens, and the air fills with birdcalls. Hot showers, delicious food and a campfire beckon. This safari embraces the best of Zimbabwe, notably Victoria Falls, Hwange Game Park, Lake Kariba, and two areas of cultural and historical interest, Great Zimbabwe and the Matopos National Park (or Motobo). Start off at the wonderful Victoria Falls, where the accommodation ranges from the colonial Victoria Falls Hotel, to safari lodges and guest houses. Once you’ve spent a few days enjoying all the treats the area has to offer, head to Lake Kariba. This huge lake, created by damming the Zambezi, is one of the largest manmade lakes in the world. From Fothergill Lodge or from Sanyati, on a hillside above a gorge, the vivid Kariba sunsets are impressive – enjoy them relaxing with a delicious cocktail. Travel to Great Zimbabwe near Masvingo. This site was probably inhabited between the 13th and 15th centuries and is a fascinating and spiritual place – its massive and impressive ruins still guard the secret of its origin. Matobo National Park is an area of wild, wind-sculptured and wonderful rock formations, and wooded valleys. Bushmen paintings decorate the gigantic rocks and caves, which provide the perfect retreat for leopard, smaller mammals and a variety of glittering reptiles, while graceful black eagles nest in the lofty crags. Cecil Rhodes, the famous English businessman and controversial political figure, is buried on Malindidzimu, the legendary hill of benevolent spirits. The views from here are beautiful, and it is a very peaceful and spiritual spot to while away a little time.